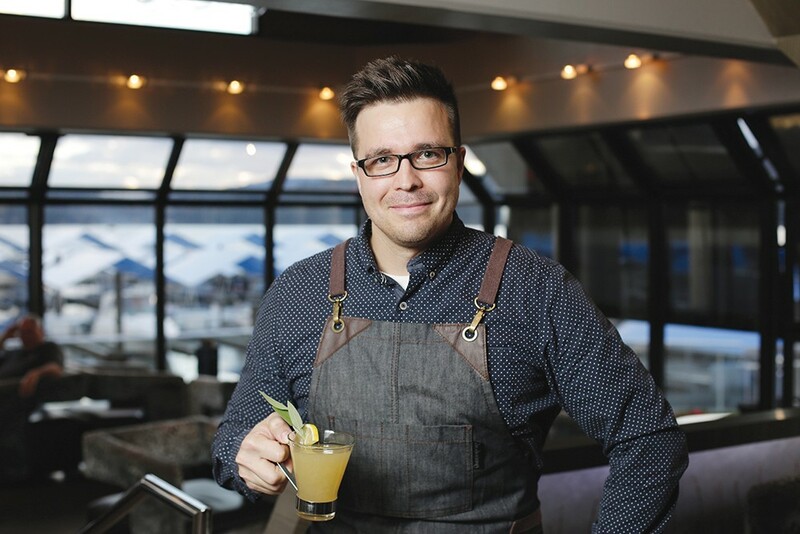 Justin Schorzman holds a Honey Sage Toddy at the Coeur d'Alene Resort's Whispers lounge. Justin Schorzman says he might have been destined to make his living in the hospitality industry. "My grandmother was a Vegas girl," recalls the affable director of beverages for Hagadone Hospitality, "who used to bartend down at the Cove Bowl," a beloved former local bar in east Coeur d'Alene. For the past six years, Schorzman's responsibilities have included much more than one cozy local bar. At Hagadone Hospitality venues, Schorzman's shifting areas of focus have included managing multiple Hagadone venues at a time, from the Unchained Taphouse inside the Resort Plaza Shops, to the seasonal Boardwalk Bar and Whispers Lounge, as well as the Resort's numerous convention center and related events, along with a stint as GM of Beverly's. "All the while being heavily involved in cocktail creation, training, and purchasing for the property," he adds. Schorzman says he begins the process of creating a new beverage by getting inspired. "I go to a supermarket, or a farmers market, I pick up fresh ingredients and I take them home and spread them out in front of me." He then tests out various combinations, and ponders what spirit might accompany them. A great cocktail appeals to all the senses, not just taste. Schorzman says drinks should obviously be enticing to look at, but he's especially interested in the aromatic elements of his creations. "When you bring the cocktail up to your nose, what you take in before that cocktail even reaches your mouth has a lot to do with how you perceive that cocktail," he says. His cucumber lemongrass martini, which won first place at the 2015 Bartender's Ball, requires roasting the lemon rind garnish with a torch. "That brings the oils out so it has a small smoky nose to it. It floats right over the cocktail, so you are getting that roasted lemon scent," explains Schorzman. Schorzman says his bartenders regularly receive requests for festive beverages that are either low-calorie or alcohol-free. Creating enticing drinks under these conditions is a challenge that he relishes, noting that drinks can often post eye-popping calorie counts. "An eggnog cocktail has 750 calories, and a margarita is about 280 to 340 depending on the ingredients," with alcohol contributing 94-100 calories an ounce. To create sophisticated mocktails with complex flavors, Schorzman transfers techniques he uses with his craft cocktails. He actually gets a helping hand from Idaho's restrictive liquor laws. Because Idaho law doesn't permit the state's mixologists to infuse liquor with flavors — the alcohol has to go straight from the bottle to the glass — Schorzman says he's accustomed to developing other flavorful elements by other means. "I do a lot with simple syrups, honeys, agave nectars. I'm using a lot of fresh ingredients, spices and herbs around the cocktail before it meets the alcohol." He also enjoys exploring extracts — strawberry, peach, almond and more — that he finds at Pilgrim's Market in Coeur d'Alene. "A little goes a long way and they're fun. They add that complexity...Those things can easily be used in a mocktail, and it still feels like a craft experience." After a pleasing flavor profile has been developed, unsweetened club soda is a good choice to help mediate sweetness, in the same way that vodka or gin does, greatly lowering the calorie count along the way. In situations where a tiny bit of alcohol is permissible, Schorzman says bitters are fun to experiment with — noting that even though bitters have a high alcohol content, a single drink uses just a few dashes, which contribute a negligible amount of alcohol.